Ylang-ylang Essential Oil has a sweet, exotic, floral scent that is one of the most sought after aromas. Ylang-ylang Essential Oil is extracted from Cananga odorata – also known as flower of flowers. It is a tall tropical tree about 20meters (60 feet) high with large, tender, fragrant pink, mauve or yellow flowers. The yellow heads are viewed as being the best in terms of quality. Ylang-ylang Essential Oil can assist with problems such as high blood pressure, rapid breathing and heartbeat, nervous conditions, as well as impotence and frigidity. Spiritual practitioners claim that the users of Ylang-ylang are those who have been drawn to the oil, and who in turn, suit it. 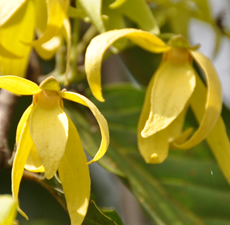 Ylang-ylang Essential Oil is best suited for use in the perfumery and skincare industries. In Indonesia, Ylang-ylang flower petals are strewn upon the bed of newlywed couples. It was a popular ingredient of hair preparations in Europe and was known as Macassar oil. The word anti-macassar originated from this, since an anti-maccasar was used to keep hair oil from staining upholstered furniture. Ylang-ylang Essential Oil can cause sensitivity on some people and excessive use of it may lead to headaches and nausea.